Kota Kinabalu: The State Cabinet decided unanimously Wednesday to allow the transfer of Sabah’s Sumatran rhinos such as Tam on loan to the Cincinnati Zoo in the US under a collaborative natural breeding in captivity programme to stave off the imminent extinction of Sabah’s last remaining few individuals in Danum Valley. “This is a step Sabah didn’t want to take in the past but it gives us no other option and the State Cabinet has agreed to the recommendations of the Sabah Wildlife Department to go for the ultimate option to work with the Cincinnati Zoo,” State Culture, Tourism and Environment Minister, Datuk Seri Panglima Masidi Manjun told Daily Express in reference to an export ban of rhinos imposed in 1985. “I want to get it done as soon as possible, because we have been waiting for years and so far, we have not found a solution that we thought we could get it done,” Masidi added. But leveraging on the world’s only proven success of Cincinnati Zoo, particularly the like of Dr Terri Roth who had had successfully bred three baby Sumatran rhinos in captivity. The birth of male Andalas on Sept 13, 2001 marked the first birth of this complex species in a zoo in 112 years, followed by female Suci in July 2004 and subsequently male Harapan born on April 27, 2007 and later helped Indonesia to sire a fourth – Andatu, in 2012, in Way Kambas, Sumatra, using Andalas as the father. “To me it’s simple, if we don’t do anything, it’s just like watching them die a natural death until the last rhino in Sabah goes extinct,” Masidi explained. 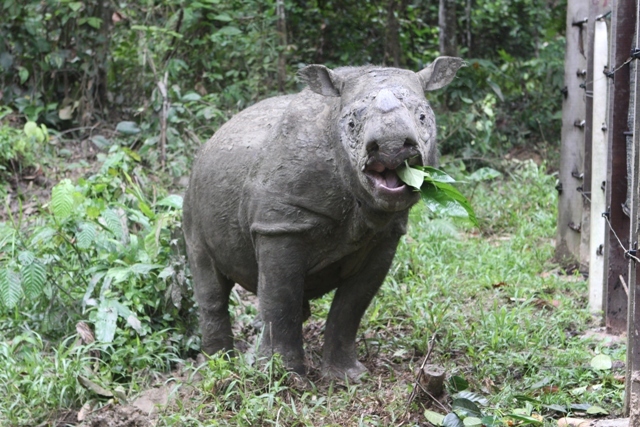 “So there is no other option, Tam will take a holiday in Cincinnati and meet his girlfriend Suci (whose original parents came from Sumatra),” Masidi quipped – a request long sought by the Americans who believe mating Tam and Suci which come from two totally different genetic lines will produce genetically robust ancestors for future generations of Sumatran rhinos. “We don’t want the rhino to go extinct during our life time. We are at a crossroad, so we are willing to take any chance although the risks are always there,” Masidi said. However, Masidi said the State Cabinet also gave the Wildlife Department a “reasonable time” of four to six months to capture a female rhino in Danum Valley, since camera traps caught images of a female as recently as Dec 2013. If the female is indeed captured, it implies Tam will stay on a bit longer to mate locally. Asked if he would invite Dr Terri Roth to Sabah to help enhance the chances of success of this local breeding if any, Masidi said: “Yes, we should allow anyone with the expertise to help. If Dr Terri had bred three rhinos she must be some body who is well qualified to assist,” Masidi said. “I was made to understand that Cincinnati Zoo is more than willing to help us. Even the Germans are more than willing to help us, so we should not limit any body who offers assistance, anyone we feel have the expertise I think we welcome the assistance,” argued Masidi who said he had never met Dr Terri Roth but would certainly welcome a meeting to talk over what’s the best way forward. While Dr Terri’s forte is natural breeding in Captivity, the Germans from Berlin are reputed for their cutting edge technology in Artificial Insemination which had great successes with the elephants and other species of rhinos. The Sumatran rhino Crisis Summit held in Singapore in early April 2013 recommended the simultaneous utilisation of the world’s best and the most proven expertise in natural breeding in captivity and Artificial Insemination to get a safeguarding population in captivity produced as fast as possible. Meanwhile, Director of Sabah Wildlife Department, Datuk Dr Laurentius, who presented the Cabinet Paper Wednesday, said it was a “very happy day” for him. “To us it is dream come true, the best option I can think of ,” he told Daily Express. “The credit goes to Masidi who pushed it through and kept on pushing until we get the result today, for the betterment of Sabah’s Sumatran rhino,” Laurentius noted. The Cabinet Paper documented the various steps Sabah had taken in order to breed rhinos locally since the 1980s including an export ban so far had not succeeded. It also included recent plans to capture a female to breed with Tam after Puntung had proved cysts infested but so far, the targeted new female remains elusive. Finally, Laurentius argued that the option was for Tam to go to Cincinnati where a healthy, cyst-free nine year old Suci is just at the prime of fertility offers a chance to get pregnant by Tam.